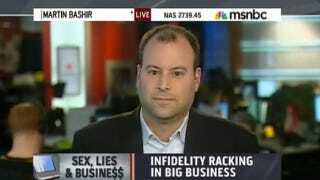 Today MSNBC's Martin Bashir spent a few minutes investigating the delusional world of Noel Biderman, CEO of the adultery website AshleyMadison.com. "They do love and cherish their families, the economic situation, their extended family, but what they don't cherish is what goes on or doesn't go on in the bedroom and that's what they're looking to change. They want to stay within their marriage. That's why they're pursuing an affair. If they wanted to leave, they could leave. Many people do pick up and leave, for their own selfish sexual needs. People pursuing affairs are trying to stay in their marriages." Right. Cheaters are a noble folk who choose to keep their marriage strong by violating the promises they made to their spouse. Maintaining the status quo by living an elaborate lie is definitely preferable to having an honest conversation about your "selfish sexual needs" and the various other problems in your marriage. Has their ever been a couple that wound up working through their issues and developing a stronger relationship after one spouse cheated? Sure. But we're willing to bet that isn't what will happen for most people whose partners are using AshleyMadison.com. In fact, Biderman says he'd be devastated if his own wife hooked up with another man. However, he's quick to point out that he didn't invent cheating. He's just willing to facilitate the process and make money off the misery of others. "Infidelity crosses both genders, every socio-economic group, ethnic groups. It's a worldwide issue. So my market potential is probably larger than singles dating sites. Are we the next billion dollar company? I would argue so."